Let me say, right off the bat, I’m not Irish. I’m mostly English and a bit Swedish with some Scotch and Welsh and American Indian thrown in to round me out. Nevertheless, I was brought up to honor and celebrate St. Patrick’s Day. Because, on St. Patrick’s Day, everyone is Irish, right? So, allow me, in honor of the occasion, to tell you a funny story about my mother. My mother believed strongly in celebrating holidays. All holidays, not just the big ones like Thanksgiving and Christmas but all holidays. Valentine’s Day was major at my house, we got gifts like at Christmas. So was St. Patrick’s Day – despite the fact that we were not Irish. We would have corned beef (the grey kind, please) and cabbage and all the other vegetables and Irish soda bread. So this one year my mother decided we should also have green beer. I think I was actually in college at the time, but, because it was a holiday, I was expected to come home and be with the family. And eat corned beef and cabbage and drink green beer. Are you ready for the funny part? My mother spent days trying to buy green beer. She visited every package store (because that’s what we call them here in New England) in the city searching for green beer. In a bottle. Finally, in desperation, at the last package store in town, she asked the guy at the counter where she could find green beer. He looked at her incredulously and asked her what she was talking about. She told him, “hey, it’s St. Patrick’s Day and I want to serve green beer. You must have green beer! Where can I find the green beer?” After he finished laughing, he said, “lady, you can’t buy green beer. You just buy regular beer and add green food coloring.” “Oh,” said my mother. “I had no idea.” At which point she and her pink cheeks headed to the grocery store to pick up some green food coloring and some Budweiser. In honor of my mother, I’ll be drinking a wee bit o’ green beer made from Budweiser and food coloring today (then I’ll switch to Guinness, the real beer of Ireland). And, Dale will be wearing his new Irish Hiking scarf – which just so happens to be green. 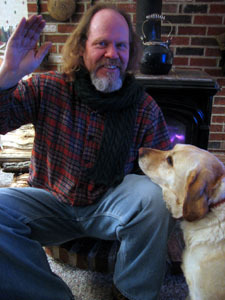 Here’s my Swedish Leprechaun, with Dixie, waving an Irish greeting to you. Top o’ the morning to you from Carole O’Knits. your poor mom. she’s too cute. haha. I’m looking for green shirts for my kids now. They are part Irish (my husband Dale’s side), so we’ll celebrate. And I do intend to pick up some Guinness today too. Ah, nothin’ like a good yarn (as it were) and a bit o’ blarney to start off my St. Paddy’s Day. Thanks! The scarf is lovely. I love your mom. Really. Since you can’t get a green beer for love or money in Ireland on St. Paddy’s Day, I’ll be celbrating with a Kilkenny or a Guiness. Thanks for my morning smile. Hey, I just looked down and I’m still wearing my green fleece bathrobe. Does that count? Of COURSE the Irish Hiking Scarf should be green, and O’Dale looks very happy and handsome in it, too. Well done, O’Carole! Great story! Doesn’t Dale look handsome in his new scarf (which is lovely, btw. Happy St. Patrick’s Day! Dale’s new scarf looks great, and will be Just the Ticket today. Happy St. Patrick’s Day! Nice scarf! Wish I could get Aaron to wear handknit things. What a cutie!! Great scarf, too. I love how Dixie is gazing at him in absolute adoration. Happy St Patrick’s day to all of you! Happy St. Paddy’s day to you and Dale! Enjoy! I’ll be eating Corn Beef for the first time ever tonight… is it good?? Top o’ the mornin’ to ya! 🙂 LOVE the scarf. Nice work! Gorgeous scarf.. fabulous story! Aren’t Mom’s great!! and happy Saint Pat’s day to you too! You should know – and I speak from experience here – that you can, indeed, buy green beer for St. Patrick’s Day, but only so long as you’re willing to get an entire keg, and only if you’re willing to drink Miller Lite or Coor’s Lite. Blech. Also, it turns your tongue green. Aw, I love that story! Ah, I just love that Mom story! Brings a tear to me eye! All that’s irish on me is my ring finger. And my married name. But this makes those that I love Irish, and so am I! I love that you have a green FO on St. Pat’s Day! Pretty funny! I like your mom………. 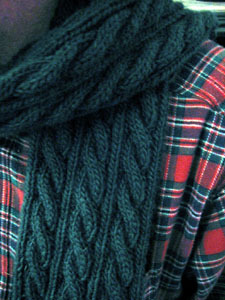 And the Irish Hiking scarf looks pretty good. Do you put on all your “bling” on St. Pat’s day, like you do for Oscar Night? Green is my favorite color, and somehow, brain dead on a Friday morning, I left the house without any! I love the story about your mother, and also Dale’s scarf… that is a great pattern and if I had made it in green would probably still have it, but made mine for charity. Happy St. Paddie’s to you and Dale. I guess we know where I get my ditziness from! Unlike my mom I am Irish, so of course I can’t wait for the corned beef and cabbage tonight…I still remember the year I drank green milk on St. Patricks day. Happy St. Patty’s to ya! I’m havin’ me some of the pink corned beef for dinner. Me father’d be proud. Irish by scarf! It’s beautiful and it looks so handsome on a foine lad such as Dale! I love your mom too! That’s such a sweet story. Dang. I always wanted a mom like that. My mom was meaner’n dirt when I was growing up. All my friends were frightened of her. She thought it was funny. What a great O’Scarf & O’Story. Hope you both enjoyed the celebration.